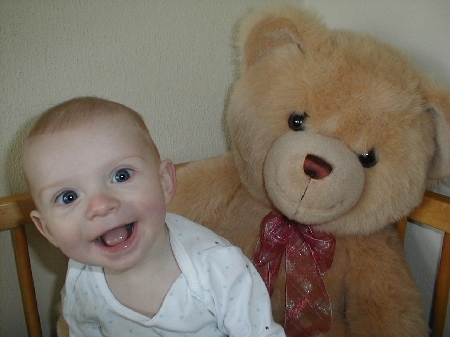 Every month Liz takes a new photo of Phil in his crib with Teddy (a gift from his Great Grandmother Jane). Here is his six-months-old shot from yesterday. He doesn’t usually sport this “I’ve been sniffing stimulants” look but is generally happy — except when we try to feed him solid food, which makes him constipated. No teeth yet. He can’t really crawl or sit up, either, but is making progress on both fronts. Wow! All I can say this that this is TOO. DAMN. CUTE. As I recall (my youngest is 17), crawling is largely dependent on back strength which my girls got enough of at about 7 months. This may also be a function of height and maybe weight so Phil may crawl a little later if he is a taller baby. Standing and walking follows in a few months. Speaking of bowel movements, I think I finally figured out my ideal racing cuisine: Luke warm tea with plenty of sugar (taking a page from the British road racing book), rice porridge, and olives. The result in a 44 mile practice outing was no abdominal distress and none of the usual drop off in pace at the 25 (or so) mile mark.